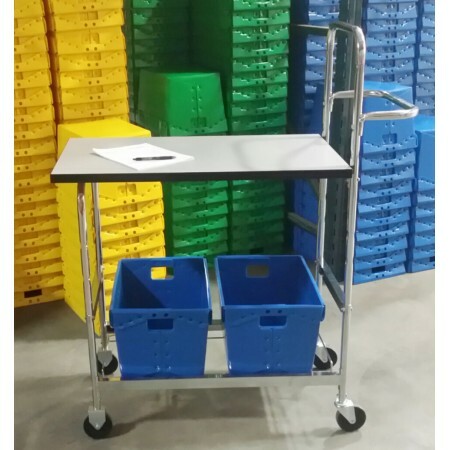 These warehouse and office carts have many purposes. They can be used in the warehouse for order picking or counting inventory. In the office they can be used for delivering supplies or picking up certified mail. Combine these carts with many of our optional totes, baskets and bins to make the carts useful in your organization. 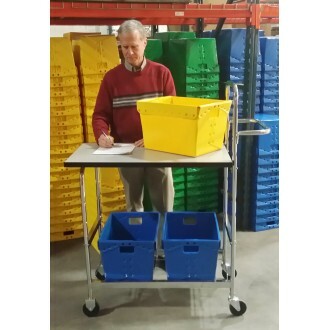 This medium mobile cart is maneuverable around the office corners and tight warehouse spaces. Writing surfaces are at standing height. Not shown but available are 4" high rails to keep paper work and packages for slipping of the cart. Writing surface is Grey. Two table top length options 36" (Shown) and an extra long 48" extra long top. Overall: 43"L x 20"W x 52"H Writing Surface at 36"